Part of the issue for me gets back to the role of so-called critics, pundits, and writers. I'm less interested in opinions than I am in descriptions of the music: how it made you feel, how it sounded, etc. Mr. Olewnick's review tells me more about his own personal taste and prejudices than it does about the music made. Is it the role of a critic to dictate what a musician should or should not do? Is a critic more qualified to determine how a musician should interact or play in a band than the musicians themselves? Of course it's okay not to enjoy something, and to enjoy one thing more than another. But to make essential value judgments about musicians, their intent, and how they go about their art, to me is distasteful. Obviously, I don't agree with the above, otherwise I wouldn't be blogging. One of the things that I like about this medium is that it doesn't pretend to be about anything other than the blogger's personal tastes and prejudices. Many Old Media writers (especially jazz and classical critics) try to wield the authority of their publication like a cudgel. They make sweeping pronouncements in a stentorian tone like they have some kind of special insight into what is Great and True about Art. But studiously avoiding the use of the first person doesn't make their opinions any less subjective and personal. I'd like it if more critics were more explicit about where they are coming from. I also think it's a good idea for everyone to talk openly about the stuff that's going on in our scene -- what we like about it and what we don't. Disagreement and controversy are good -- they are signs that people feel passionately about this music. Because our scene is so small and marginal, it's understandable that some people want to paper over the differences and project a united front to the world: "Everything is great! Every artist is great! Every show is great! Come check out how great everything is!" But I actually think that's counterproductive -- to an outsider, that kind of boosterism looks transparently insincere. I'm not saying people should be mean-spirited. I'd hate for the comments in the jazz blogosphere to descend into pointless, reflexive snark, like the comments on some of the bigger indie rock blogs. But people should be free to say, "I didn't like it, and here's why" without everyone else bringing the house down on them. Obviously, this becomes even trickier when you are yourself a struggling musician trying to establish yourself in a scene that you are also blogging about. It would be a lot safer for me to never say a critical word about a fellow artist, but then this blog would be incredibly boring and no one would read it. At the same time, I also have a direct and personal sense of how hard it is to just get out there and make your music happen. So I try to temper any criticism with a sense of perspective -- I'm not trying to make any Grand Pronouncements about anyone else's art. I'm just trying to express how I responded to it. See also Pat Donaher on Zorn/Hadju, the Vision Fest, and related issues, and also Will Friedwald (NY Sun) for yet another take on the Friday night hit. And feel free to mix it up in the comments -- bring on the aesthetic fistfights! It's as if someone exhibits a bunch of paintings that are, essentially, de Kooning knock-offs and insists you perceive them as "new" and "visionary" because they're "abstract". They may not be "bad" (however one wants to define that) and I'm not suggesting most of the music at Viz Fest is, but I think it's undeniable that much of the vibe there is in the collective belief that the audience is experiencing adventurous, daring, experimental music. And, with limited exceptions, it's just not. Darcy and Brian, thanks for your thoughts on the matter. The above paragraph you quoted definitely needs further clarification, because what I was really trying to point out is what I see as a fine line between intelligent and thoughtful discussion of merits and critical issues and getting into the realm of assigning value. While I agree that the casual format of the blog is great for spreading the opinions and thoughts of the many, thus breaking up the monopoly of traditional media, I still believe there is a responsibility to stick to some kind of ethics in writing about art. When someone googles the Vision Festival, they might find my blog or Brian's or anyone else who's taken the time to write on the subject. I'm not condoning a blind boosterism, but there is something to be said for writing about the beauty in one thing and leaving (some) of the rest unsaid. I can extrapolate a lot about what a person doesn't like based on what they do. Mostly, I believe there's a responsible method and vocabulary to use that allows for transparency of bias and productive criticism. Something that the artist could read and maybe get something out of, that might lead to some kind of productive examination. Brian, I guess I have a different understanding and expectation in terms of what "vision" or "free" or "experimental" might mean in the context of the music being made. I personally don't expect most of these artists to continue pushing the boundaries in the same way they did in their youth. Instead, I see them mastering the boundaries they've already pushed, and in that way I agree with you that they represent their own form of conservatism. I just enjoy seeing someone like Kidd Jordan who has obviously honed his sound and style to a point where he's instantly identifiable and distills a very clear musical essence to my ears. Hi- Brian O., thanks for taking the time to clarify what doesn't hit you about the VF. I was initially thrown by your take on it for a lot of different reasons. Dan, the ethics of criticism are on my mind all the time as one of my day jobs is as a theater critic in a *very* small town. Yikes. Anyway, there's room at the moment in my aesthetic universe for music that is partly improvised and partly structured. I am still moved. But I can also hear what just doesn't get inside me, somehow. Two examples from the past year for reference: Vandermaark 5's Sonny Rollins, Art Ensemble's "covers" of old AEC gems on Non-Cogntive Aspects of the City. Yet Roscoe Mitchell live with his quartet floored me. Perhaps I have been too willing to continue to think of creative composed and improvised music as "avant" or "new," when it's mearly 5 decades old. Not having been at VF I can't comment on those performances. I guess it strikes me that music that sounds very, very out to so many people, especially in America where it has not really had a stage, can sound as trad as Wynton to other ears. Not just trad. Bad. Bad trad. Stale. Imitative. Sad. Hey Brian, Dan, Peter -- thanks so much for commenting. Your continued contributions are much appreciated. When someone googles the Vision Festival, they might find my blog or Brian's or anyone else who's taken the time to write on the subject. Yes, and so? Is it really such a terrible thing if someone stumbles upon Brian's assessment of the music he saw? I think there are a different set of responsibilities when writing for The Paper of Record than when writing on one's personal blog, and the scene as a whole is healthier precisely because bloggers are generally able to operate with fewer restrictions. For instance, Beirut was kind of famously savaged by bloggers for their first live show, but if anything, all the online vitriol seems to have only stoked further interest in the band. It certainly doesn't appear to have hurt them, long-term. If the Vision Festival really is committed to presenting forward-looking music (and contra Brian, I actually think they did a better this year than they have in years past of including at least some of that), then you would think the last thing they would be afraid of would be stirring up a little controversy. Thanks for the comments, Darcy, Dan, and Peter. I'm generally of the opinion expressed by Darcy above--the more views on a subject, the better. I have no problem whatsoever with listeners posting contrary opinions to my own, including negative ones about stuff I love. I mean, I've waxed rhapsodic about things like Sachiko M's sine wave performances and had my own sanity questioned. If someone savaged her show, especially on conceptual grounds (finding it vapid, trite, etc.) so what? I've never quite understood why some (not necessarily those present!) get bent out of shape when people don't like something they love. If well expressed, it might cause me to go back and re-evaluate my judgment. Dan mentions a "blind boosterism" and I do think there's something of the sort in play here, just as there is in any genre (including eai). One of the disconcerting things I've noticed at Viz Fest is that virtually every set gets huge applause and standing ovations, not all that different from what you encounter at your standard corporate pop event. Some may suggest that, hey, they're honoring the musicians for what they've achieved in their lives, not necessarily for that set. Maybe so, but a part of me is thinking that they're just willing to accept anything served to them. Again, fine if that's what they're going for but I do think it's healthy to have at least a few observers willing to raise an eyebrow. Hi- Interesting that you mention Beirut, as they are much beloved here in Santa Fe, having originated locally. The show I saw here in Santa Fe last autumn was a strange phenomenon, with a small room packed to the rafters with a young audience giving an ecstatic reception to what sounded like heavily diluted "World Music" to my jaded ears. While it may be true that there's no such thing as bad press, it's also interesting to me to get to know the aesthetic and more broad cultural camps in the fringe arts. Camps in general are fascinating to me for the simple reason that I'm culturally omnivorous...easy, like Sunday morning. Maybe my sense (right or wrong or both) is that the "mainstream" is so monolithic that anything fringe whatsoever ought to be welcomed under a fairly large tent? Is there a way to cultivate this welcoming attitude without engaging in "blind boosterism"? Perhaps I framed my discussion poorly, because reading back on Soundslope and here I can see how my thoughts might come across as advocating the stifling of critical discussion, which was not my intent. I guess my main point is this: if someone (not necessarily Brian or anyone else here) is going to to write about a show or art, I think it's important to take the time to write in depth enough that any criticism conveys something of value to the reader who's trying to formulate their own opinion. One problem with the nature of the blog format is that a casual comment that before might have happened in person can now be broadcast over the entire internet, and with that comes some responsibility. The thing is, you don't really want to restate previously posted opinions (and any backup thereof) every time you make a post. Agreed, it's not necessarily the fairest of situations but for myself (as far as the blog goes) I'm assuming most of the readers are familiar enough with my views on stuff via various other fora, or if not they can understand that the views aren't just appearing out of nowhere and that there's a history they can delve into if (for some ungodly reason) they so desire. imho, one of the virtues of the Net is opening up those sidewalk conversations to a larger public. The more honesty, the better. 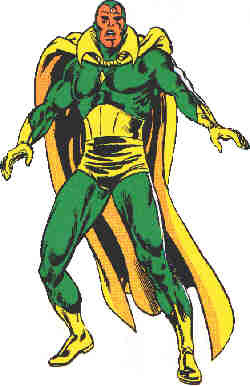 btw, Darcy, The Vision was always my favorite Marvel character from back in my misspent youth. I love this site because not only is the writing very interesting, but the links that you share are always so good. I love discovering the new sites here!